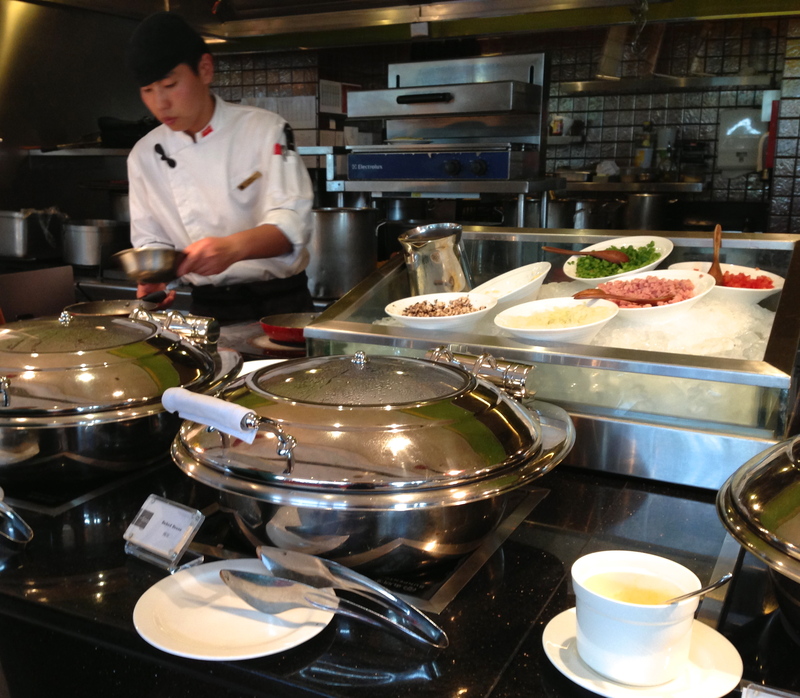 If you’ve ever traveled in any part of Asia, you may be familiar with the type of breakfast fare most high-end hotels offer. The choices are mind boggling…and this is coming from someone that thinks of herself as a gluttonous eater! I thought it appropriate to end my Shanghai/Suzhou visit on a food post because if you know me by now, happy stomach means happy me. Imagine waking up to this extravagance…every…morning. I’m not sure if it was a dream or a nightmare? 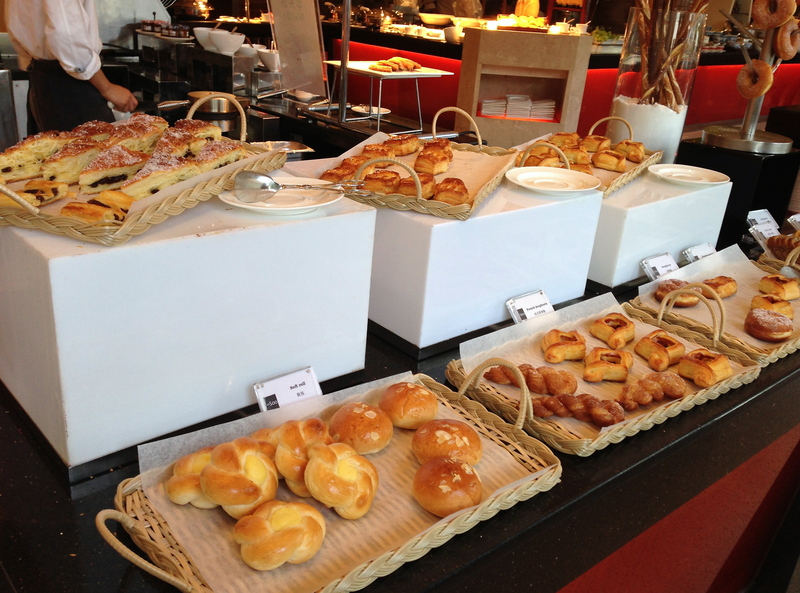 Nevertheless, this was the breakfast buffet at the Shangri-La Hotel in Suzhou. I buzzed around with my cell phone taking these pics as quickly and unobtrusively as possible because there were more important things to be done, like, EATING! Priorities! I’m sure you can understand. 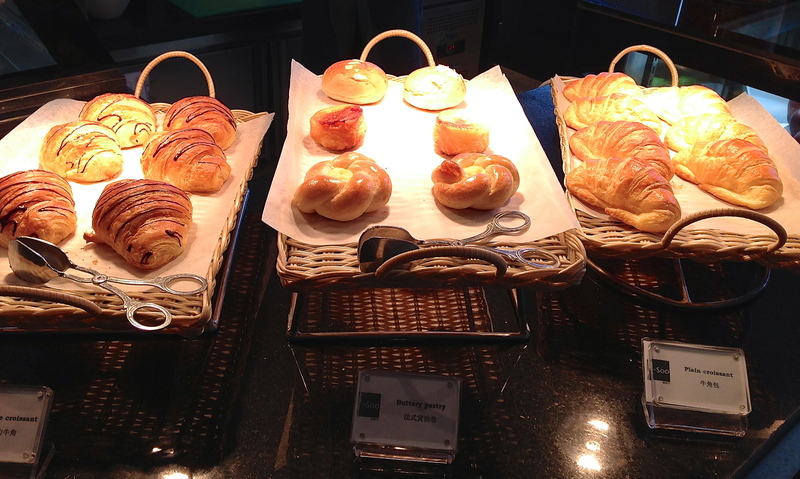 We start with the pastries. Personally (and mercifully) not to my liking, so I was safe here despite an entire four-sided station dedicated to all things carb/sugar related. 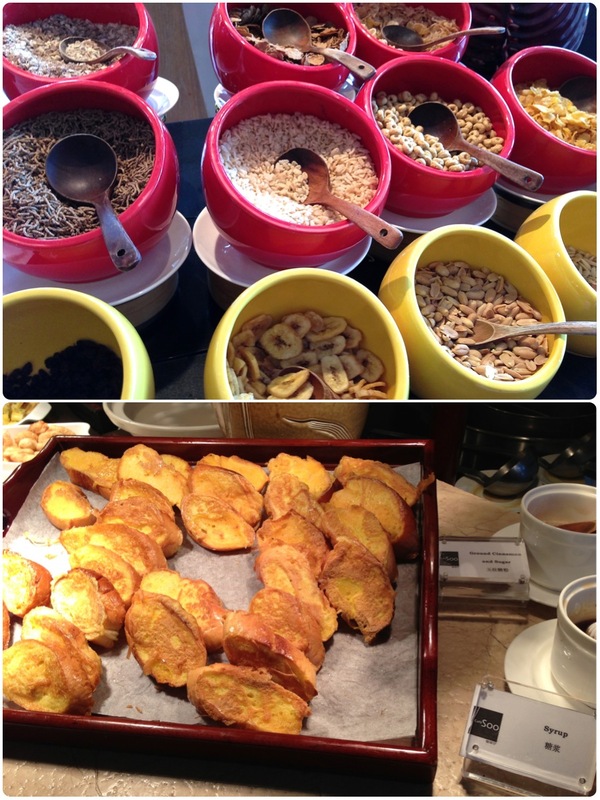 A selection of cereal and french toast. Let me draw your attention to these large silver servers. I didn’t want to stick my nose in and open every…single…one…of…them…just to take photos. But, in hindsight, I regret not showing you some of the delicious dishes, such as sautéed chinese vegetables, the fried noodles…ACK!…taiwanese-style pancakes, braised tofu! 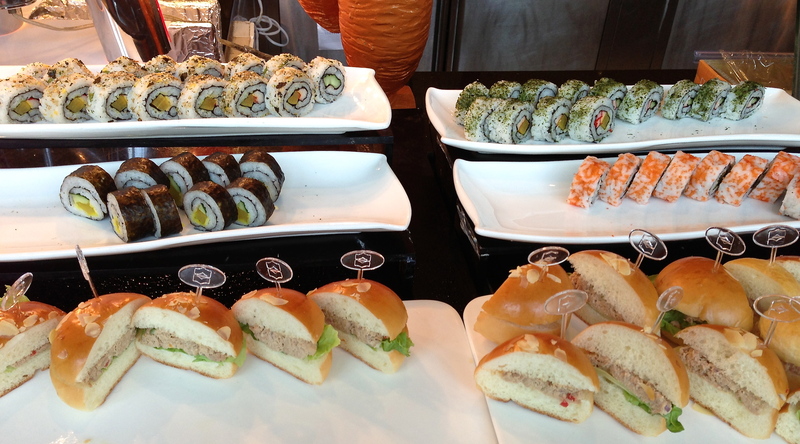 It was seemingly endless and all so good (trust me, I tried them all)! I’ve said it once and I’ll say it again, “Bad Blogger, Good Eater!”. 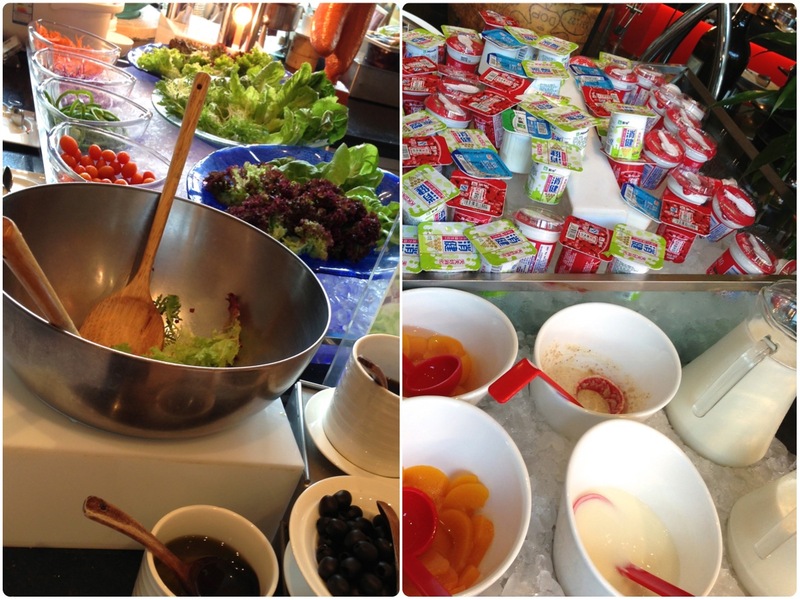 What about a do-it-yourself salad and yogurt bar? 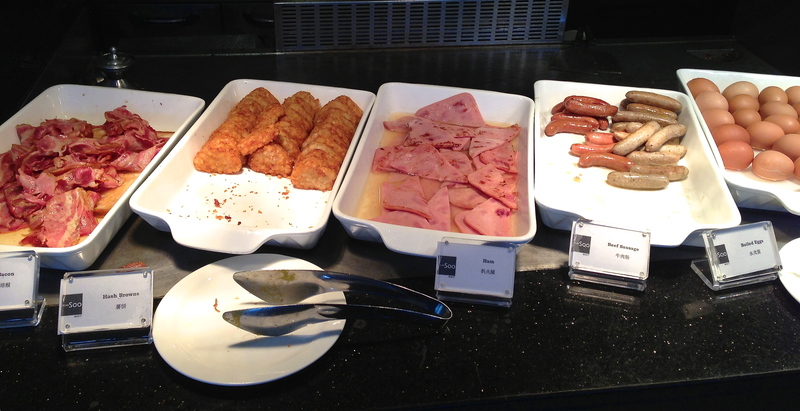 For those of you needing a little taste of home – some hash browns, bacon, ham, sausages, eggs. 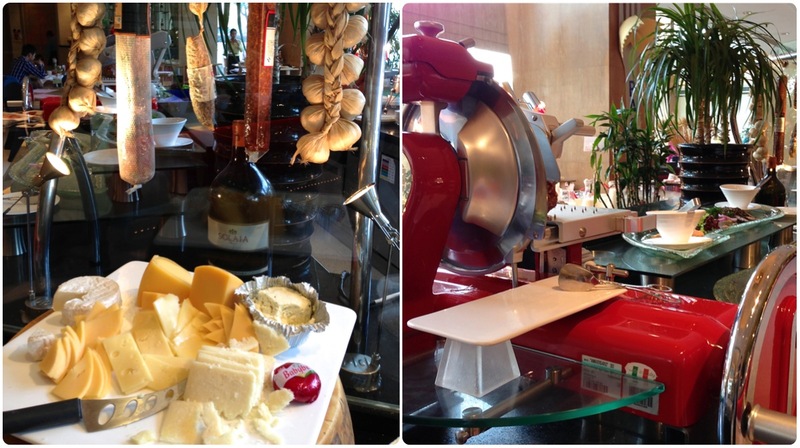 …or help yourself to fresh salami, cold cuts and cheese! 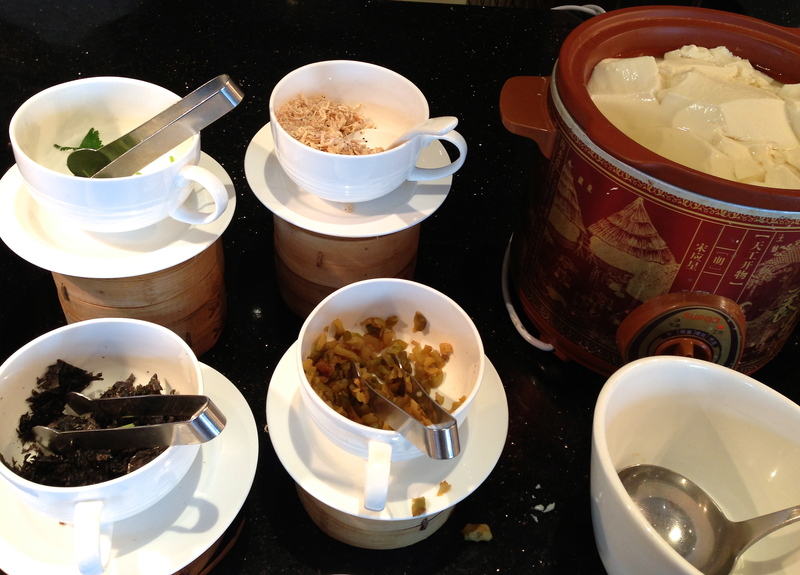 …then hot bean curd with toppings? 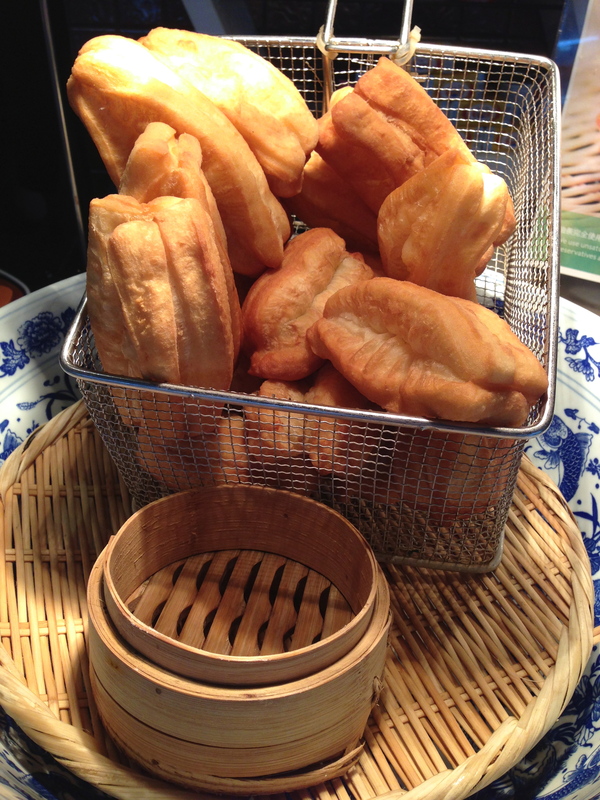 Perhaps a fried Chinese donut? It is savory, simple and wonderful. 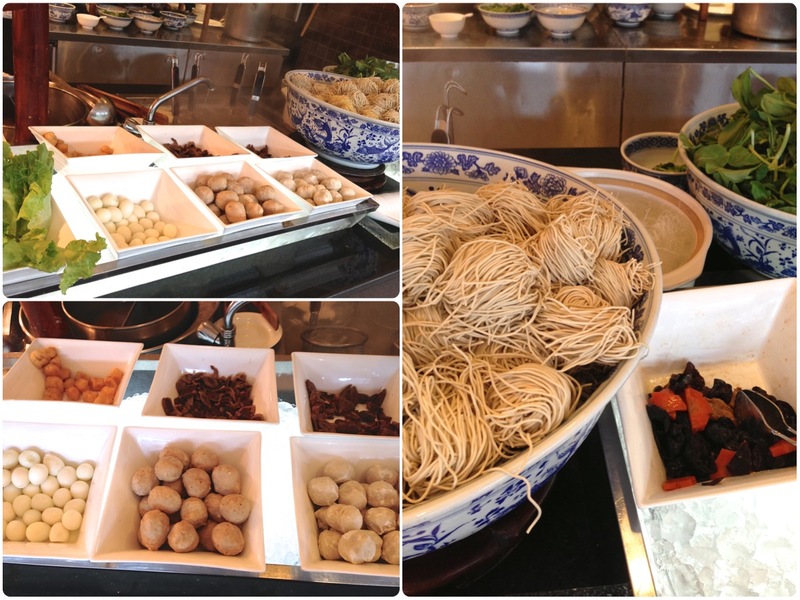 …or a fully stocked, made-to-order, soup noodle station. I’ve died and gone to heaven! 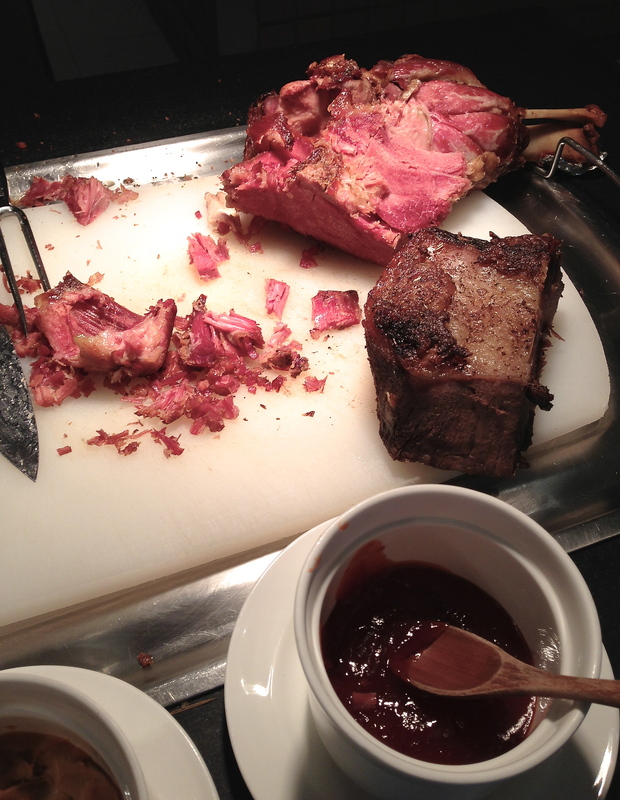 But, wait, is this breakfast, lunch…dinner?? Who cares, keep it coming! 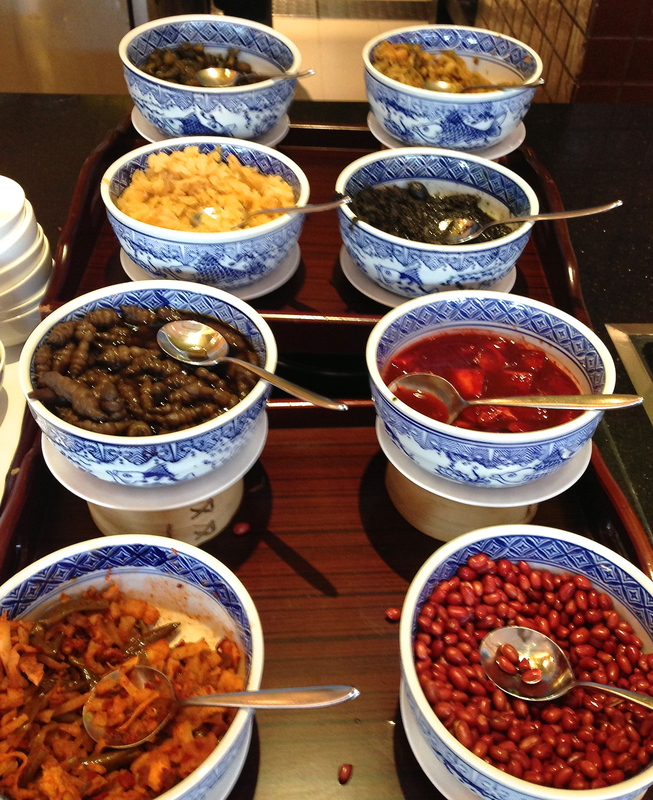 Ooh, let’s not overlook all of the accompaniments for the noodles. Another personal favorite, the steamed rolls and dumplings. 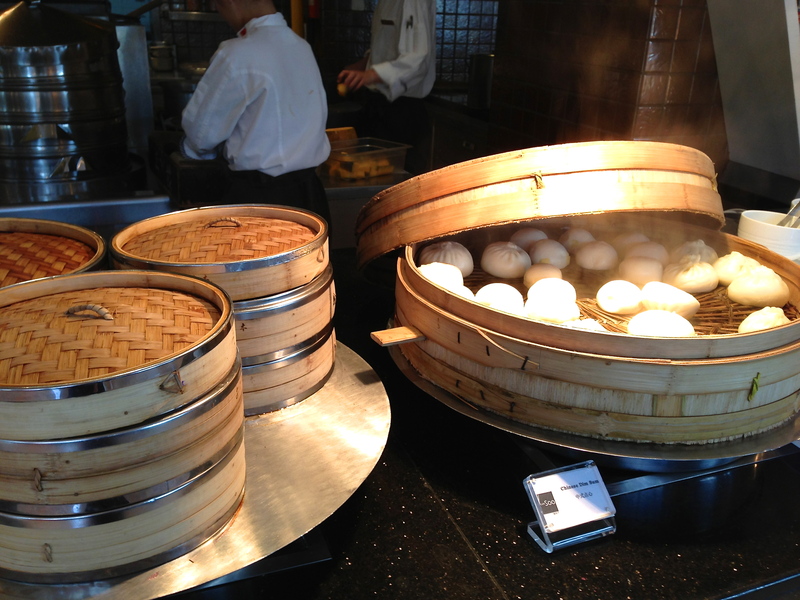 I don’t think I’ve ever eaten so many dumplings in one week…well…ok, you got me…not since the last time I was in China. I certainly feel like a dumpling! 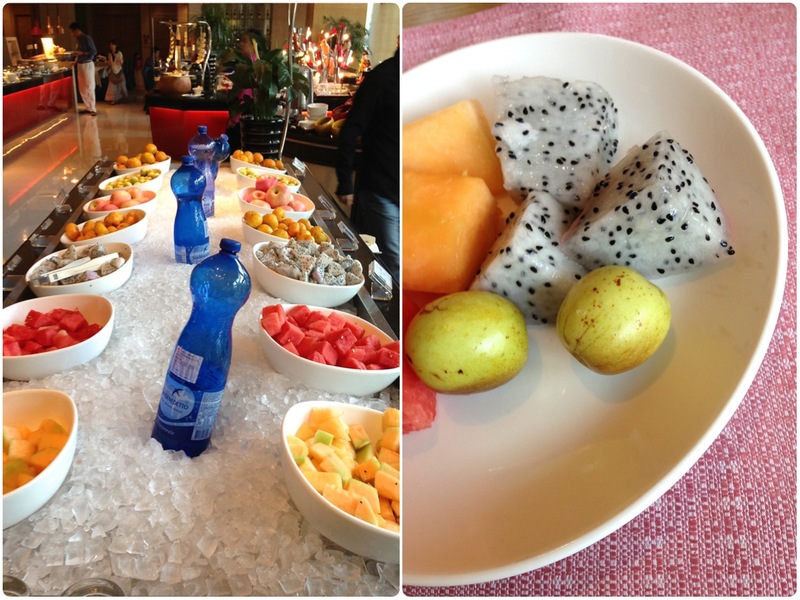 We’ll end this on a healthy note, the fruit station! Honestly, by this time, there usually wasn’t much room for some healthy-for-you fruit, but I always ate a few pieces thinking that they might offset all of the more…um…tastier unhealthy choices I made. As you can see, it is much like a Sunday Brunch buffet in America, minus some of the Asian choices (especially some of hot dishes that I didn’t show you), but this was only a Monday morning! Needless to say, it was a challenge to shrink my stomach back to its normal size when I returned home since I was starting my day eating ALL of this for a solid week! “Some” good things should come to an end…sigh. I hope you can tell from my posts that I had a wonderful time in China. But, the very best part was getting to spend one-on-one time with my lovely, petite Mom and it was a pleasure to see that she can still out-eat me…sometimes! I thought all worms were slimy! In this case, it’s still true because Silkworms are not actually worms and they are not at all slimy! 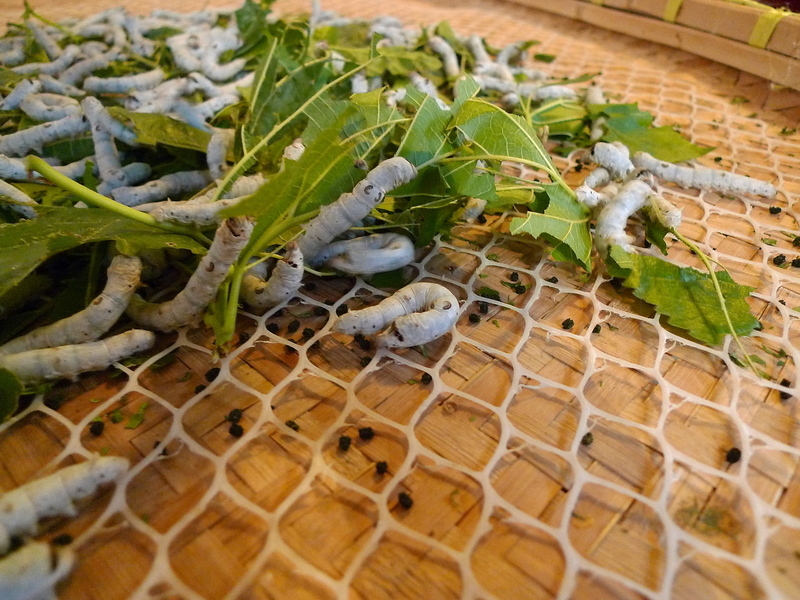 Silkworms are the larval form of a silk moth, Bombyx Mori (don’t worry, this is as scientific as I’ll ever get!). Another attraction that I was looking forward to visiting in Suzhou was the Suzhou No. 1 Silk Factory. State owned and operated since 1926, this is a working silk manufacturer that offers an up-close-and-personal look at their facility. 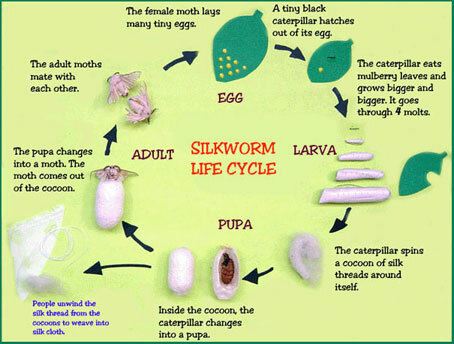 I found a nifty chart online that explains the lifecycle of the silkworm better than I ever could. Refer to it as you follow along with my photos! 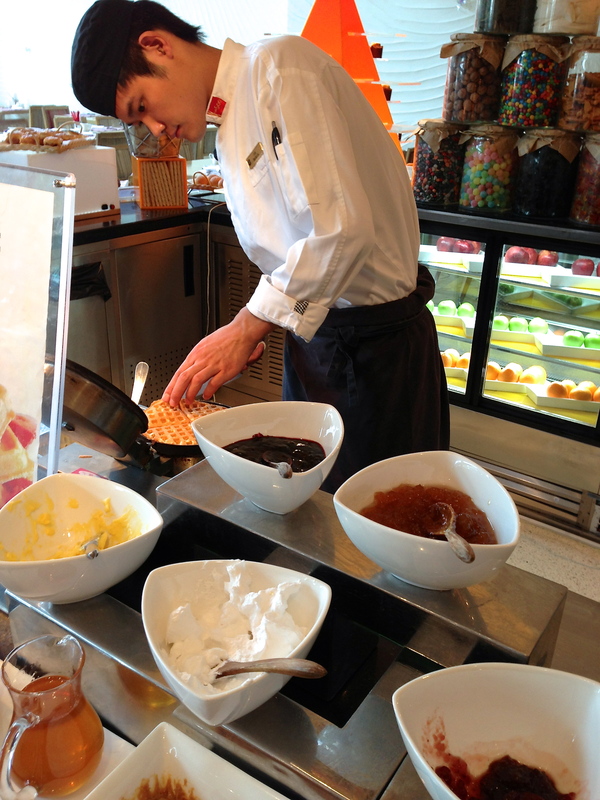 This worker is sorting out the smaller caterpillars to be moved to another tray. 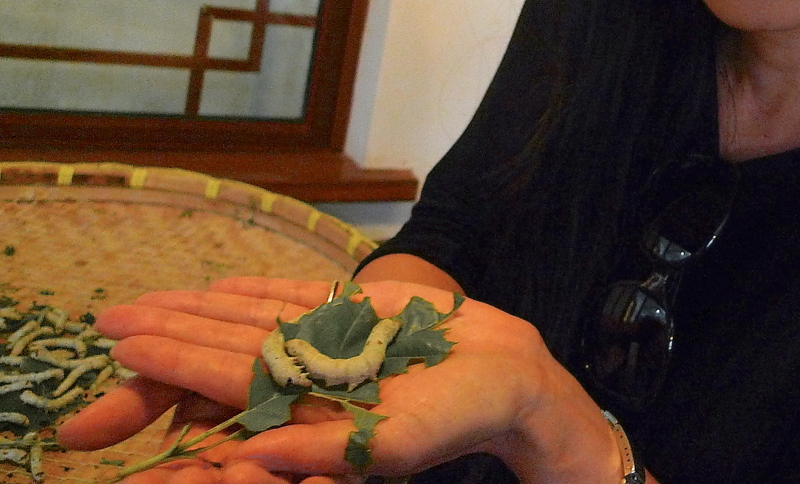 She kindly allowed me to touch and hold the caterpillars, and to my surprise, they felt velvety and soft like silk! Their food of choice are Mulberry leaves and they are quite the voracious eaters! I can relate. Heh. Now comes the time that the caterpillar creates his cocoon. 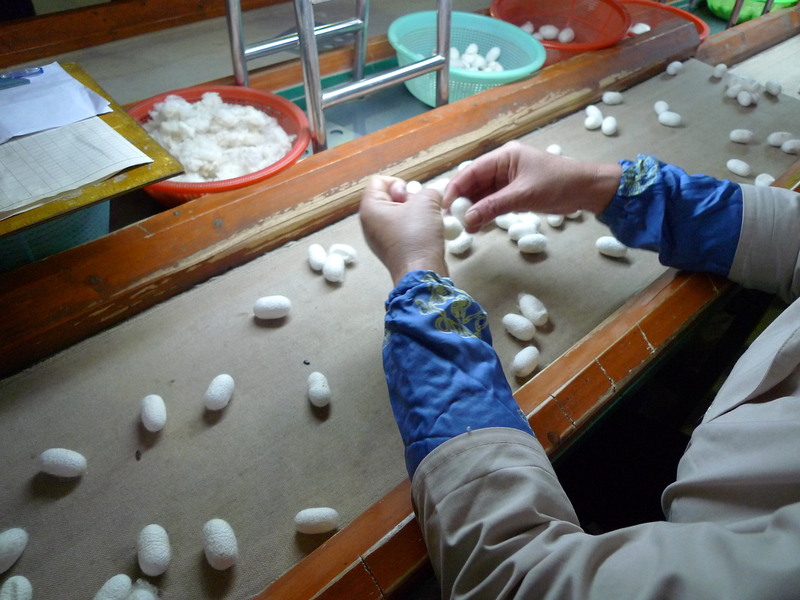 What’s amazing about this process is that the silkworm creates its cocoon out of one single silk thread that is continuous for approximately 3,600 feet! They showed many different types of “homes” for the caterpillars while they’re busy spinning away their cocoons. This was my favorite. Isn’t it fabulous?? It’s like organic art. 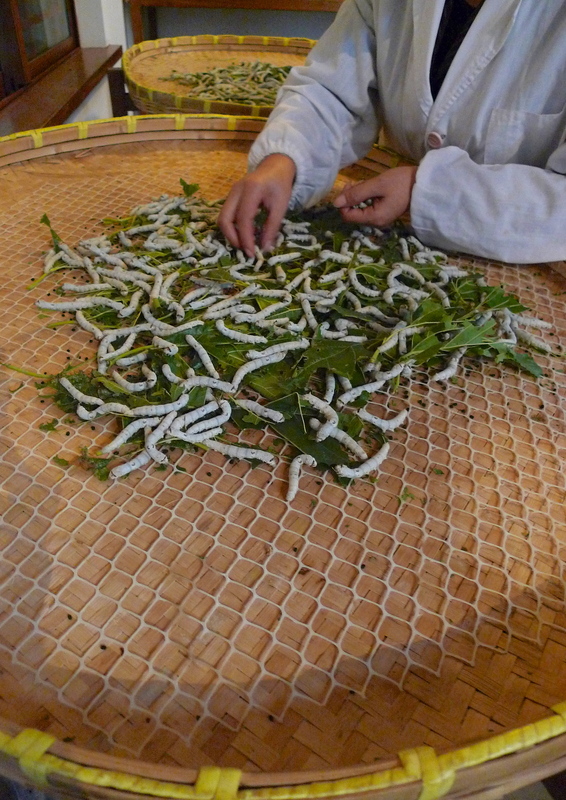 Next they put the cocoon in an oven/high heat to kill the silkworm inside, but not damage the cocoon. No visuals necessary, right? Here, the cocoons go through a grading process. 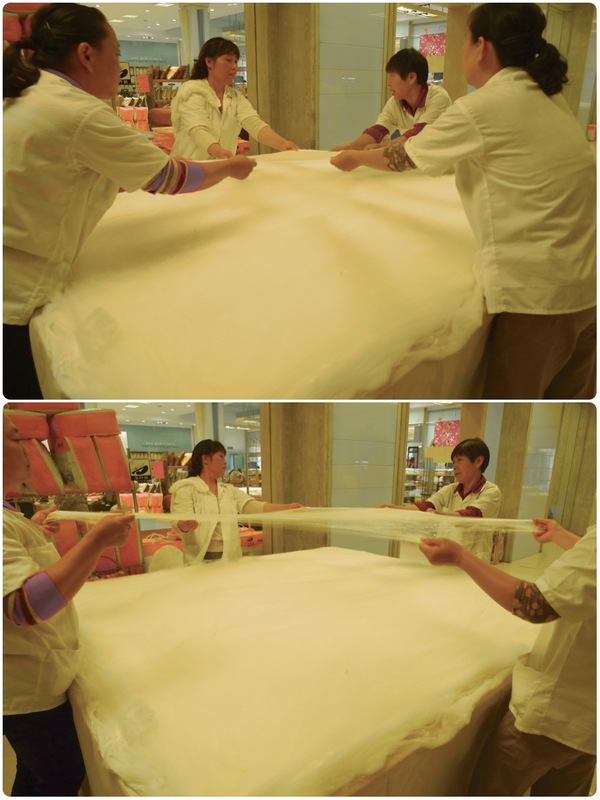 “First choice” cocoons are chosen for their clean and white color, good luster, uniform layer of thickness and neat shape and size. 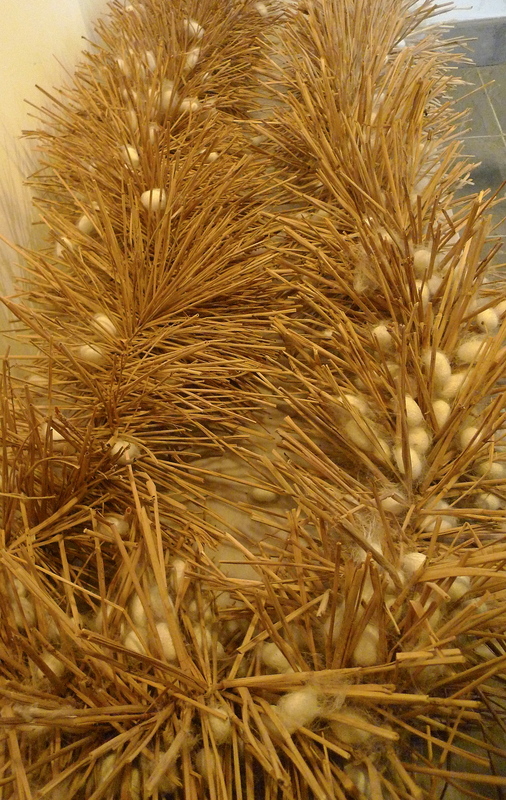 These are the ones that are used for silk reeling, which is the next step. 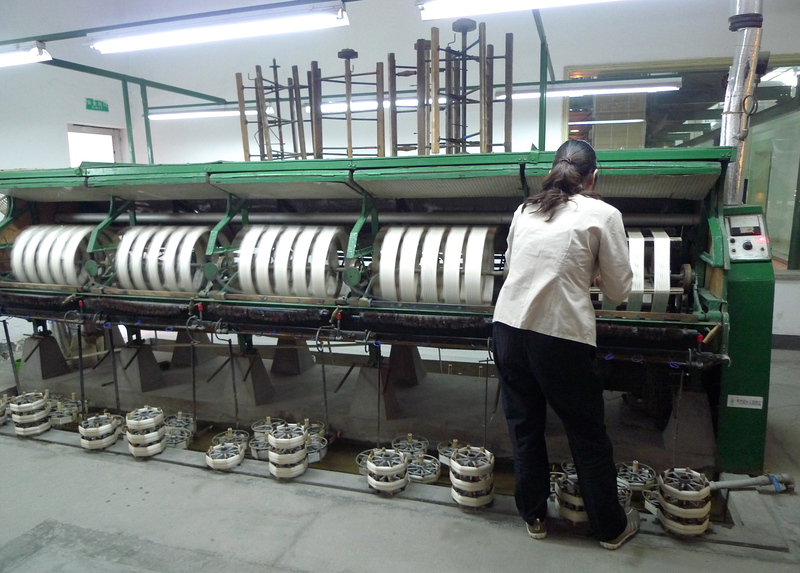 These workers are operating this old-style machine that spins the silk filaments into skeins, this is called “Reeling”. 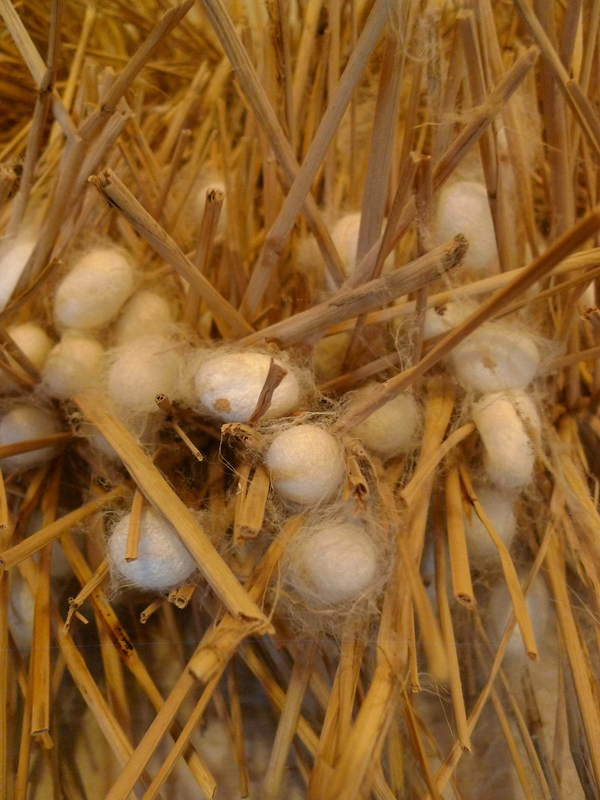 Each cocoon is attached to each spindle. Do you see the fine filaments working up from the clusters of cocoons (in the water) to create the skeins of white silk thread above? 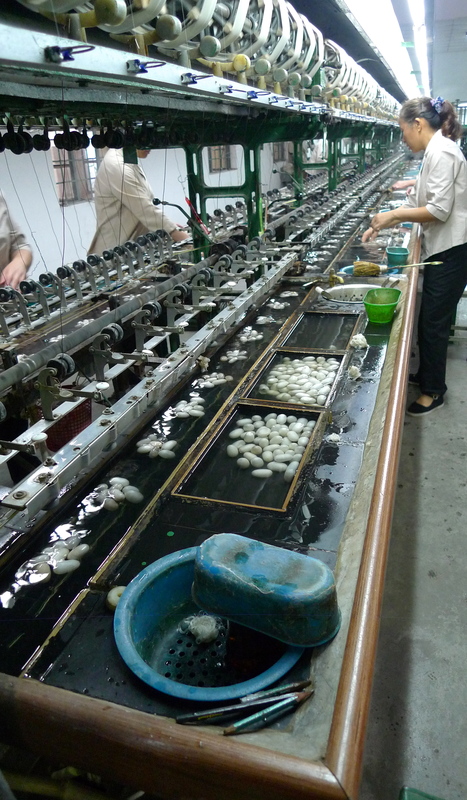 …the cocoons are stirred vigorously in hot water and then the filaments are pulled up and captured to be attached to the silk-reeling machine. You can appreciate how laborious this all is and how many cocoons it takes for just one skein of fine silk! The main aim of this Re-reeling machine is to rid the skeins of moisture but at the same time to retain elasticity, strength and elongation rate. 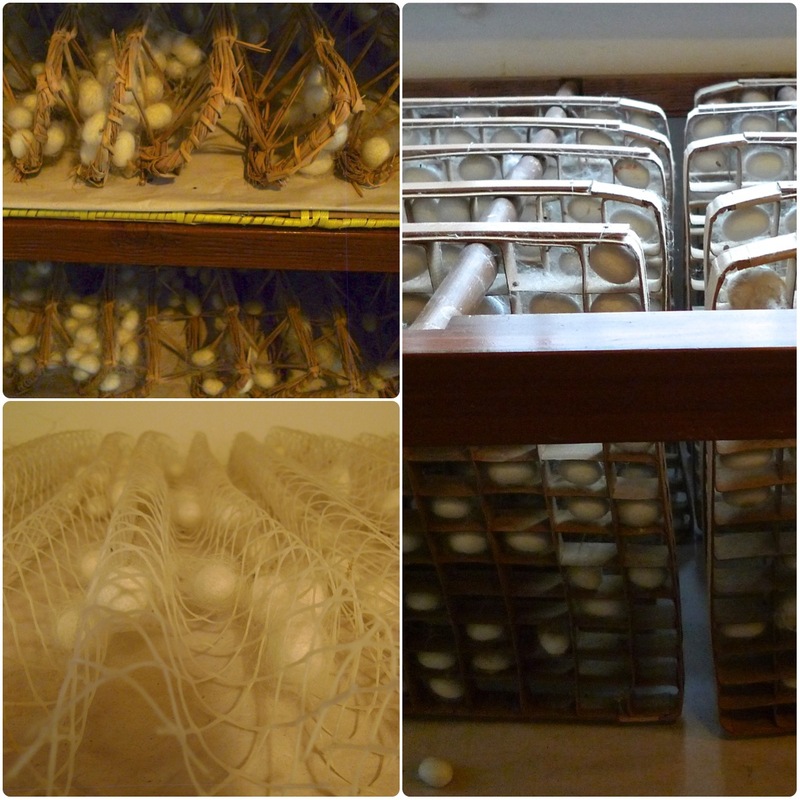 Then the skeins are made into hanks of certain specifications to be baled and packaged for storage and transport. 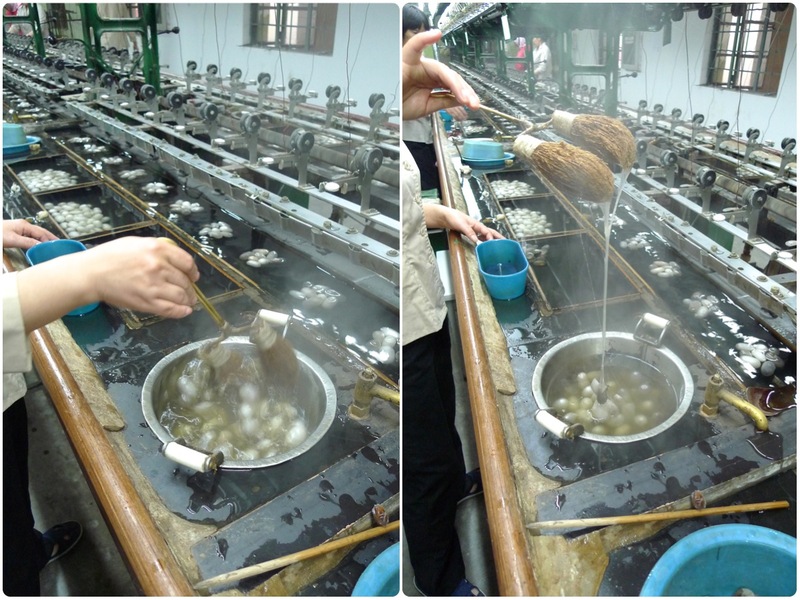 At the factory they demonstrate how the silk is hand-pulled when making their silk comforters. All in all, it was a really nice tour. It is self-guided unless you are part of an organized tour group. Doesn’t it give you a much better appreciation of all of your silk goods?